Congrats to Tanya M. and Fleur G.!!! This week we are having loads of fun doing crafts and activities inspired by Julia Donaldson's book The Gruffalo as part of our Virtual Book Club for Kids. Our friends at The Gruffalo have partnered with us to share some Gruffalo love with you this week too!! We will be giving away TWO Great Big Gruffalo Prize Packs to TWO Toddler Approved readers! Each item is pictured in the collage above and you can also click on the links above to see individual pictures. All of these products are available at retail locations nationwide. We are SO EXCITED about these prize packs and can't wait to discover who wins! We have been LOVING both movies and the colorforms at our house so we can't wait to pass along our favorite Gruffalo items to you! The Gruffalo Website- the North American home of The Gruffalo. You can sign up for Gruffalo News on the front page! The Gruffalo Facebook Page - a great place to find Gruffalo crafts and activities, keep up to date on Gruffalo events/news/products, and a spot to find fun Gruffalo giveaways! Make sure to fill in the form below and complete the mandatory email entry. You can get up to three entries by completing all three tasks mentioned in the form below. If you need a reminder about the characters in The Gruffalo, head on over to Meet the Characters on the Gruffalo Facebook Page! The two random entries will be drawn on Friday, March 28th. I will notify the winners via email. The winners will need to reply to me within 72 hours of this announcement/email. If there is no response, new winners will be drawn. I'm going to leave you with a little Gruffalo movie sneak peek (if you haven't seen it yet). Both The Gruffalo and The Gruffalo's Child are new favorites at our house. Anytime we are remotely close to the TV my daughter asks to watch one of them. Did you enter the giveaway yet? If you have an extra second, leave a comment to let our Gruffalo friends know how awesome this giveaway is! If you missed Monday's Julia Donaldson Virtual Book Club for Kids blog hop, go and check it out! Disclaimer: This post contains affiliate links. 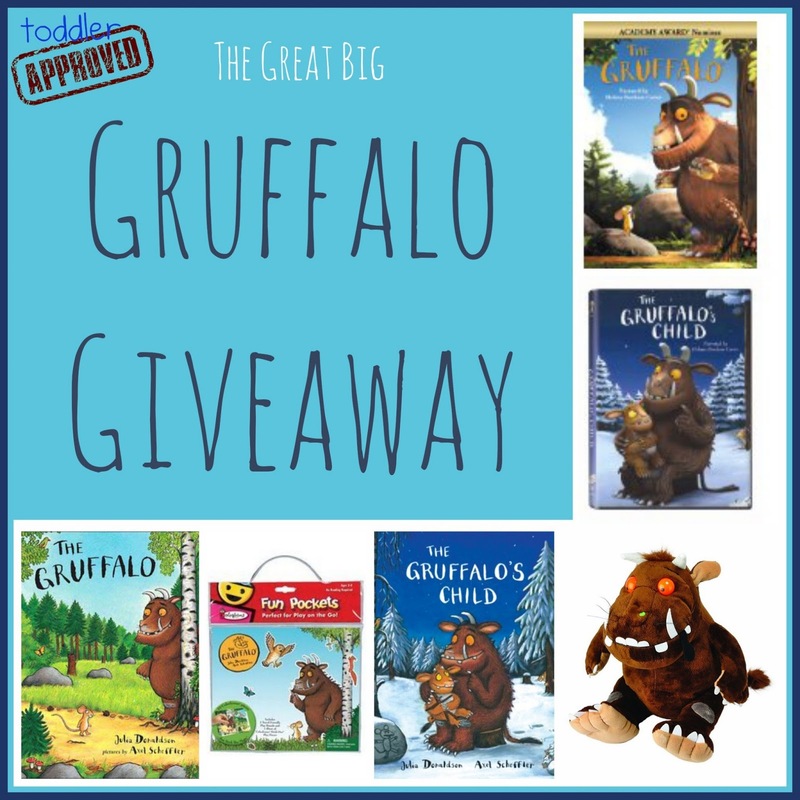 The products being given away in this post were donated by The Gruffalo brand. The opinions expressed in this post are mine. I love The Gruffalo and introduced my grandson to him when he was only about 18 months old, now he's 5 and has lots of Gruffalo things including a VERY cosy and cool Gruffalo fleece. WWe made a real Gruffalo snowman when we had snow before Christmas and I also made one with paper mache and chicken wire with the children at the school where I work! He was extremely cool even if I do say so myself!!! What a fantastic giveaway thanks for the chance to win! We have LOVED reading the Gruffalo and other Julia Donaldson books this week. This is my 3 yr olds FAVORITE BOOK. It is the first and only movie he has seen. I recently hosted a Gruffalo birthday party for him and had to order the decorations from England. I hope this story gains popularity here and they can sell more of it in the U.S. He would love a Gruffalo t-shirt! This is such a wonderful giveaway! We LOVE Gruffalo. Thank you so much for the chance! We were just introduced to The Gruffalo through the VBC for Kids. I'm so excited to see there are DVDs too! Hope I win! My grandson is 17 months. I am planning on introducing him to the Gruffalo on Easter Sunday. I'm sure he will love the story. Thanks for offering this giveaway!